Scottish rugby is 20 years behind New Zealand when it comes to sports psychology, according to Glasgow Warriors assistant coach Jason O’Halloran, who has also found that players here are less able to respond positively to constructive criticism. Formerly assistant coach with the national team under his fellow-New-Zealand Vern Cotter, O’Halloran is not usually outspoken in his assessment of the state of rugby here. But, speaking at a Warriors press conference yesterday, the 46-year-old suggested that Glasgow’s patchy away form – and indeed Scotland’s poor performances on the road – might best be addressed by concentrating more on the mental side of the game. “I think in the long term, getting some quality sports psych around all of Scottish rugby will really help – but it’s not something you can bring in at this stage of the season,” O’Halloran said. “We [Glasgow] are trying to source a provider. We’ve looked at two or three different people, so hopefully we can get something sorted out. I think it will be really beneficial. “From my point of view, as a Kiwi having come over here two years ago now, that’s the biggest area for growth in Scottish rugby, the whole sports psych thing. I don’t think it’s done particularly well at all. It’s often just seen as a bit of voodoo and witch-doctor stuff, which is where we were at in New Zealand probably 20 years ago. It’s a crucial part of the game and I think it’s something we could do a lot better. “I must admit when I came here, that was a real eye-opener for me, just how far behind New Zealand we are and how that affects our players as individuals – particularly around how they accept feedback. Sometimes Scottish boys can see any sort of constructive feedback as ‘You’re having a go at me’. That’s a big issue and dictates the way you coach and the way you give feedback or constructive criticism. That continues to be a balance for us as Kiwi coaches. O’Halloran moved to Scotstoun when Gregor Townsend moved in the opposite direction and Vern Cotter’s tenure as Scotland coach came to an end. But he retains a keen interest in the national team, and believes that if the progress shown this season continues, they can keep climbing the world rankings. “I don’t see any reason Scotland can’t be in the top three of world rugby in the next 24 months with the group they have got if they continue to grow. Look at the internationals this year and the way they pushed the All Blacks. I know it was a 14-man Australian team for much of [the game], but they put them to the sword really well. While the search for a sports psychologist goes on, the immediate concern for O’Halloran and Warriors head coach Dave Rennie is Saturday’s Pro14 match against Ulster. 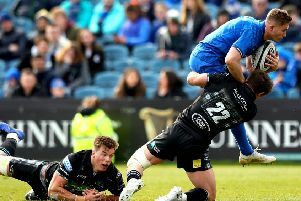 Last week’s home win over Connacht finally ensured Glasgow will have a home semi-final, so the match in Belfast will have no vital bearing on league position – but it will give the squad another chance to put things right on the road, especially after their last away game was a pretty dismal defeat by Scarlets.